President Obama, the Democrats, and plenty of Republicans in Congress, would like it if you’d spend the next few weeks talking about gun control. That’s because when you are, you’re not talking about the country’s financial situation. In 2003, when we invaded Iraq (one of those “two wars on the credit card” that Obama likes to blame for the debt), and when we passed the Bush tax cuts (the other thing Obama likes to blame for the debt) revenue actually started to climb. 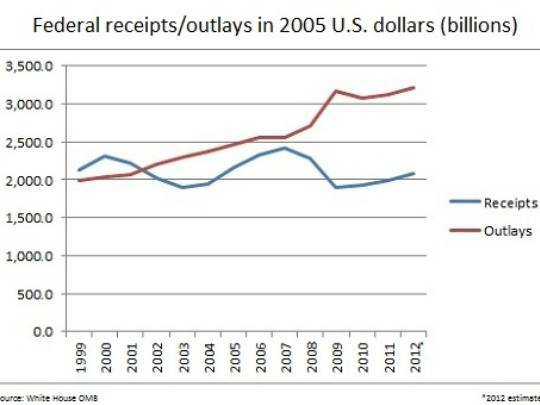 The revenue and spending lines start to converge, and, as they head up to 2006 it actually looks as if the two might cross, with revenue outpacing spending. Even the New York Times noticed, spotting unexpected increases in revenue in 2005, and in 2006 noting that a “surprising” increase in tax revenues was closing the budget gap. The heady possibility of surpluses was in the air. But — look at the graph again — everything changes in 2007. What happened in 2007? The financial crisis hadn’t struck yet. But we did elect a new Democratic Congress, with Democrats controlling both houses for the first time in over a decade. The trend immediately reversed, and became much worse with President Obama’s election in 2008 and inauguration in 2009. Obviously we cannot continue increasing our debt by 60% every four years, yet that is exactly what the Democrats have in mind for Obama’s second term. The Obama administration, if left unchecked, will destroy our children’s future. Everything else is a distraction.